Creative Chatter’s Ultimate Selfie Campaign invites you to post a picture and message on Lamar billboards nationwide for $25 donation. Simply go to creativechatter.com for more information or to participate. 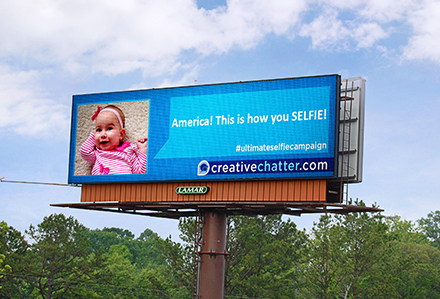 Charleston, SC – March 4, 2015 – Creative Chatter Communities, a 501(c) (3) nonprofit, is launching an Ultimate Selfie Campaign in partnership with Lamar Advertising Company, one of the largest outdoor advertising companies in North America. Anyone can simply go to creativechatter.com and upload their selfie, and a brief message, after making a $25 donation. The selfie will then display on digital billboard space donated by Lamar in more than 45 cities around the country from Los Angeles to New York. The digital billboard component of the campaign is expected to result in more than 10.8 million impressions per week. Through the creativechatter.com website, and leading twitter with the hashtag #ultimateselfiecampaign, the promotion kicks off March 2, 2015. The unique aspect of this campaign is that Creative Chatter Communities is a nonprofit technology organization that exists to meet needs, at no cost, to other nonprofits. It is actually quite simple. Nonprofits post items they need for the people they serve, individuals post items they want to donate. Creative Chatter’s software then makes the appropriate match within a 30 mile radius. It’s truly a “selfie for a cause”. Every selfie will help other nonprofit organizations find the resources they need. The Ultimate Selfie Campaign is gaining national recognition as feature articles, news stories, talk shows, and celebrities learn of the cause driven selfie posts. The partnership between Creative Chatter and Lamar Advertising Company has expanded the reach to a national level and continues to gain momentum as people near and far share selfie messages! Some selfies have gotten creative and bold declaring messages of love on a billboard size scale or even marriage proposals! Pet selfies and sports rivalries have been a big hit as well. Everyone who donates to Creative Chatter during the campaign and posts approved pictures with an appropriate message will be featured on these larger than life billboards across the country for all to see! Webcam shots from the digital billboards will be posted in an #UltimateSelfieCampaign photo album on the Lamar Advertising Company and Creative Chatter Facebook pages, so people can see their photos running on the billboards. Simply go to CreativeChatter.com and upload your selfie to be showcased! CREATIVE CHATTER COMMUNITIES, a 501 (c)3 nonprofit, connects needs with in-kind donations to create solutions in your community. Our cities, towns and villages are full of people with giving hearts who want to help with goods and skills they have available. We connect those individuals with verified needs found in the community. When nonprofit organizations spend less time looking for in-kind donations, they can invest more time with people, helping them find and implement true solutions. That’s the heart of Creative Chatter Communities. Lamar Advertising Company (Nasdaq: LAMR), a leading owner and operator of outdoor advertising and logo sign displays, announces that its board of directors has declared a quarterly cash dividend of $0.68 per share payable on March 31, 2015 to stockholders of record of Lamar’s Class A common stock and Class B common stock on March 17, 2015. Lamar Advertising Company (Nasdaq: LAMR), a leading owner and operator of outdoor advertising and logo sign displays, announces the Company’s operating results for the fourth quarter and year ended December 31, 2014.